The Dow Jones Industrial Average rose more than 100 points after a White House official left open the possibility of a trade breakthrough between the U.S. and China later this week. Shares of companies that pay hefty dividends and tend to generate stable profits in challenging economic conditions, such as consumer staples like Walgreens Boots Alliance and health-care companies like Johnson & Johnson , rose throughout the session, helping the blue-chip index overcome a roughly 224-point pullback earlier in the day. Stocks are off to a good start to the post Thanksgiving trading week. And they have at least three things working in their favor. One is the proximity to their late October low. The other is a short-term oversold condition. The third is seasonal support. The bull channel seen since 2016 is now at risk if prices fall below 2600. We see plethora of bulls to sell off under 2600. However as it has been mark of this bull run, every attempt at break of a major support has seen the initial break to have been bought back. Will we see such a attempt ? If we do, we could test previous highs. Overall the case for bull run to continue exists as the economy is in sweet spot and earnings are meeting expectation. FED is nearly at end of its hike cycle. 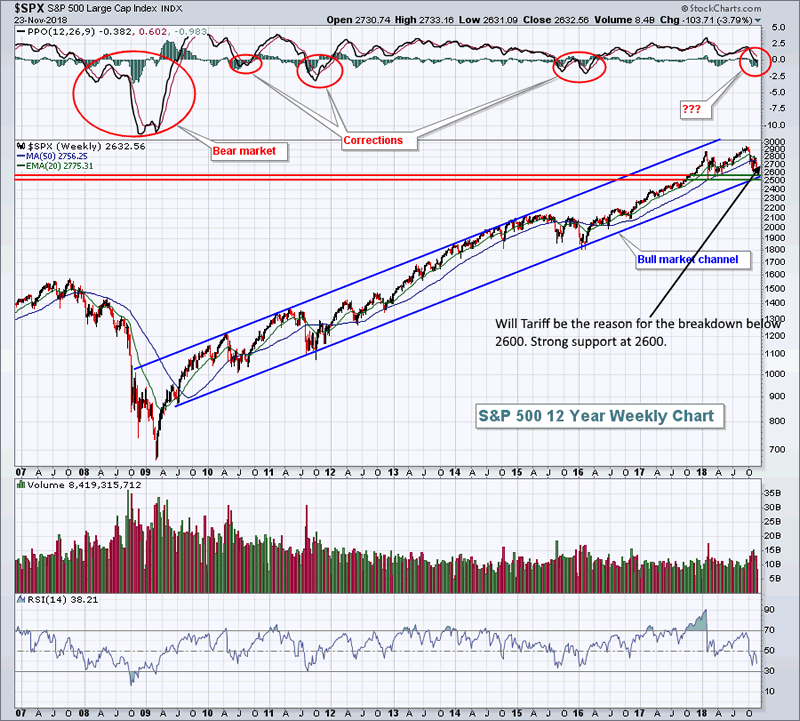 However political risks could derail the buy the dip logic from the past. Most Fed officials in September penciled in one more rate increase this year, which is expected when they meet Dec. 18-19. But their outlook for next year is wide open: They were roughly evenly split between whether to raise rates two, three or four times. They have raised the rate three times this year, most recently in September to a range between 2% and 2.25%. This has moved the rate closer to a level most officials expect is appropriate for a healthy economy, a so-called neutral setting designed neither to spur nor slow growth. Many Fed officials see this at around 2.75% or 3%. But because they aren’t sure where neutral lies, they are looking for clues in markets and economic data that might suggest whether this point might be higher or lower. This phase follows many years in which the policy path was more straightforward. 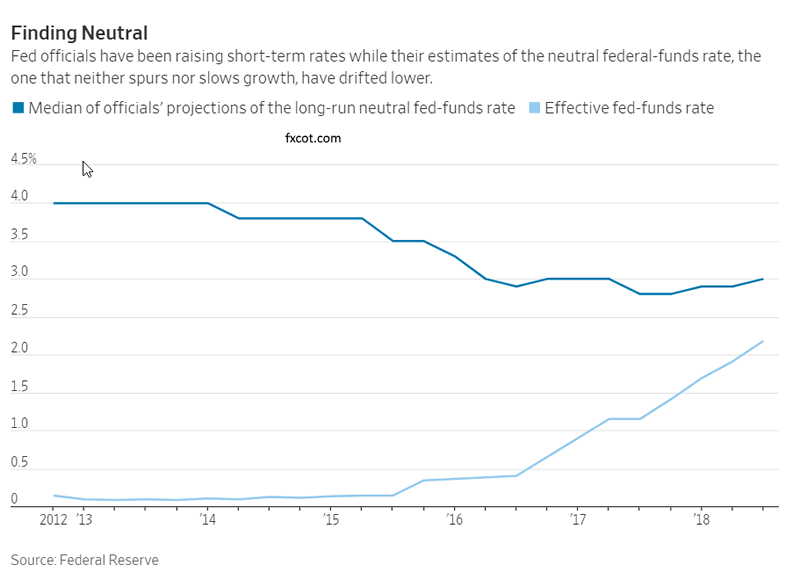 The Fed held its benchmark federal-funds rate near zero for seven years after the financial crisis, an extraordinary period of easy money aimed at supporting the wobbly recovery. Policy makers lifted the rate once in 2015 and once in 2016, as the expansion firmed. EURUSD has decisely broken 1.1380 which was the level that was needed to be supported if it was going to turn back to 1.18. Now the level is gone and barring a retest, the pair is now firmly in the grip of bears. For the remaining weeks of the year, we see a trending move in EURUSD to 1.1 and below. We see 1.11 to be achieved next week. With a brexit deal looking increasingly unlikely, GBPUSD is in a real risk of a fall below 1.2. UK parliament is set to block May brexit deal in december voting. Even if it is passed, it is putting UK at significant exposure to EU rules for market access and hence is pound negative over the long term. GBPUSD daily is set to break below 1.27 on way to 1.26. AUDUSD is holding to its mini uptrend but below 7200, the pair will fall to 7000. The chances of upside is grim. 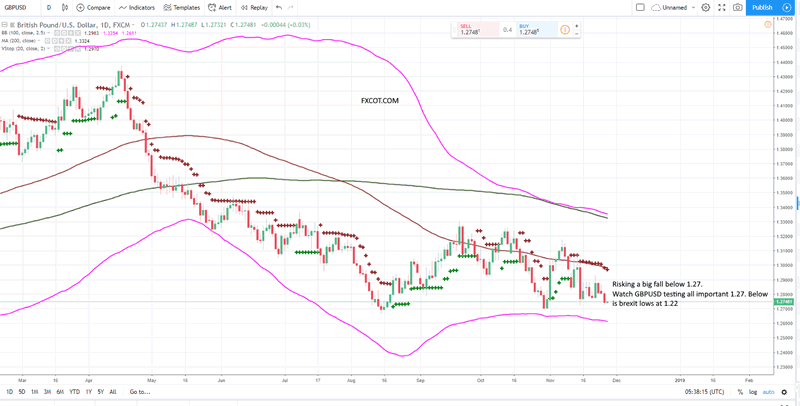 Trump auto tariff will hit China and will drive down AUDUSD. However brexit woes will support AUD as well auto tariff on EU will drive down EUR against AUD. So overall we could see some stickiness in AUDUSD but will ultimately fall to 7000. USDCHF has been consolidating at 1.000 for over 4 months. Markets were undecided. But now there seems to be high likelihood of auto tariff on EU cars from next week. It will be a deciding factor and global demand for dollar will rip higher and USDCHF will break higher as well. Be long. With Trump not ready to back down on Tariff, it is now difficult to predict which way markets will swing. The line in sand is 2600. A close below will suggest big falls. But a bounce to 2775 can possible happen if equity markets stay above 2600 even after announcement of Tariff. 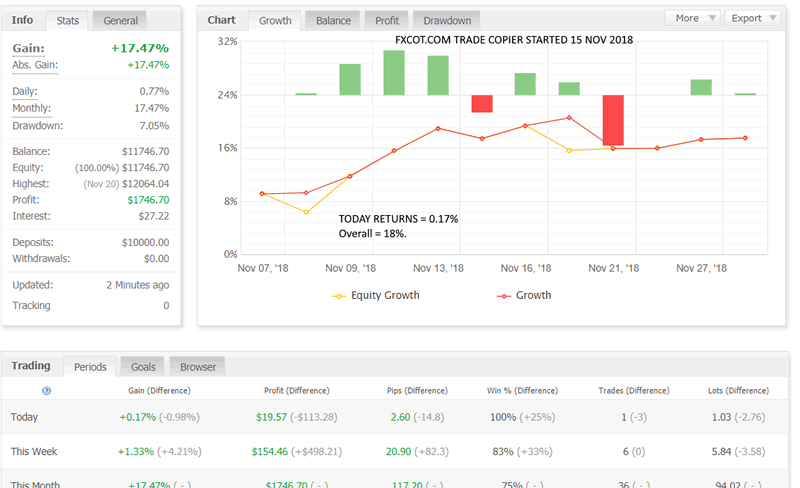 Fxcot.com trade copier was started in November after years of developement and testing. Over 20,000 trades taken from 2010 to 13 Nov 2018, we have seen all markets come up against the tradng system. They have performed brilliantly. 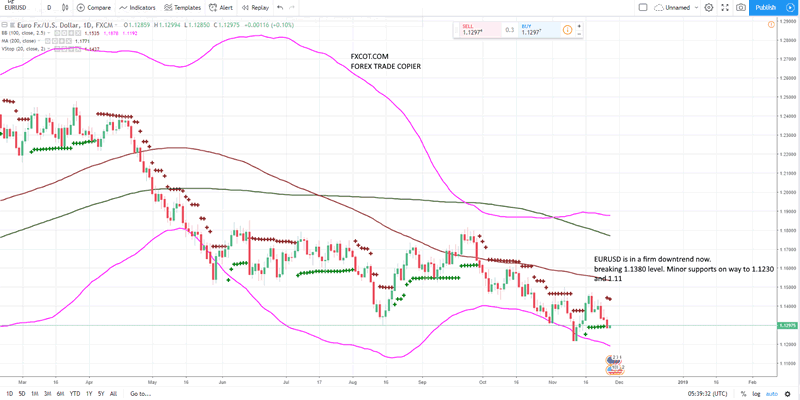 The reason why the trade copier is so far superior is because of the four different trading strategies that are working together. BREAKOUT, VOLATILITY , SCALPING AND TREND systems couple and combine together to provide a superlatie return as shown. FXCOT trading system has a system inside which scalps. The Scalping part of the trading system took a short EURUSD at 1.12719 and closed at 1.12703 and hence not exposed to market. Got in and out quickly. Here above shown in myfxbook.